With Paddy’s Day coming up I wanted to have a little fun and make a twist on an Irish culinary classic, like… em… uhh… huh. I guess Ireland doesn’t really have much of a culinary legacy. Screw it, let’s just make something with potatoes in it and call it Irish. That work for you? I kinda made these by accident when I was experimenting with my tortilla dough. Exactly like the discovery of penicillin. Alexander Fleming was trying to make tortillas, right? Only I’ve got a feeling this discovery’s actually gonna change the world. You tried your best Alex, I respect that. But it’s not as though you invented the potato taco. Yup, you read that right. Potato. Taco. When I found out that to make genuine hard-shell corn tacos, you need specially treated corn meal, my response rhymed with duck fat. I’m sure I could get Masa Harina from a specialty store, but frankly that’s more trouble than I’m willing to go to. You don’t plan ahead for tacos. They just sorta happen. Like that kid who’s ten years younger than their siblings. We’re all thinkin’ it. Except no, because I’m thinkin’ ‘bout TACOS! 1) Cook a couple of potatoes, then grate them into enough flour to make a firm dough. 2) Dice up chicken and fry until browned. 3) Throw in a spice mix of cumin, oregano, chilli powder and flakes, paprika, salt, pepper and garlic. 4) Between two sheets of cling film, roll out lumps of the dough into disks. Fry in butter until crispy. 5) Fold to make a shell, fill with the chicken and literally any other filling you can think of. Eat and repeat. It’s that simple! Homemade tacos. No more shall we be slaves to Old El Paso! Be free, my friends! Wait a second. Nothing about these is Irish! Potatoes came from South America, so these are about as Irish as Gerard Butler’s accent. Well how about this then… I’m Irish, and I’ve just feckin’ well invented them, haven’t I? So there. They’re Irish now, bud. Hang on. You watched P.S. I Love You? … It was a dark time in my life. There there. Make yourself some tacos and eat the pain away. Detailed description below. You’ll also need cling film (saran wrap) for rolling out the dough. A rolling pin wouldn’t hurt, either. 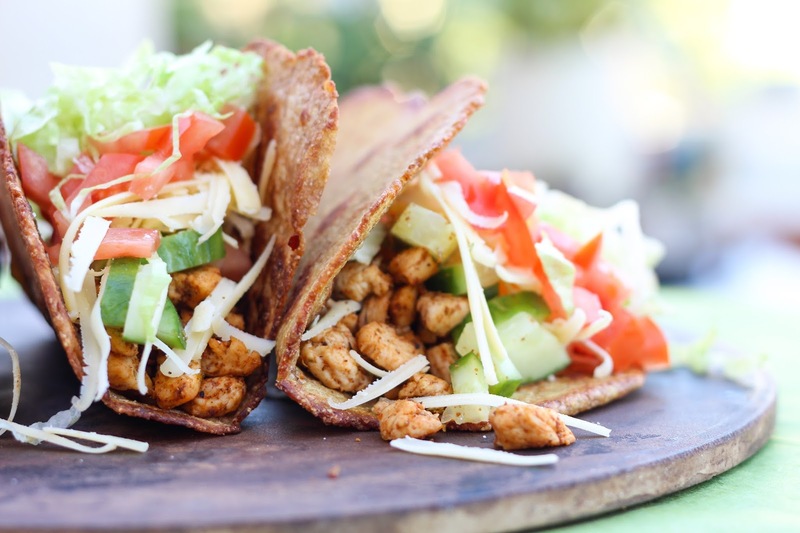 I love me some chicken tacos, but obviously these taco shells work just as well with any other type of filling. So feel free to substitute in beef, or pulled pork, or even this veggie chile. Start off by cooking your potatoes. I don’t really care how you do this, but microwaving works the fastest. Don’t bother peeling them either, just give them a quick scrub. Once they’re done you can leave them to cool a little so you can actually handle them. While the potatoes are working away, the best thing to do is get all your extra fillings ready. Wash and shred lettuce, dice tomatoes and cucumber, grate cheese… or just get some other sucker to do it, whatever. You do you. But get it out of the way now, so that it’ll be ready when your tacos are still hot. When the potatoes are ready, grab a grater and grate the potato into a mixing bowl. Hold on to the skin, which will give you a better grip, and insulate your hands from the heat. But the best part? The skin will just peel away as you go! Suuuper handy. Of course, if you want to add the skins, just chop ‘em up small and throw ‘em in. Thar be nutrients in them there skins. Now add the wholemeal flour to the grated potato, and mix it all together into a dough. There’s plenty of moisture in the potato, so you might not need any water at all. But if you do, just a sprinkle will be enough. This is actually very similar to making gnocchi, if you’ve ever done that. Well, I guess it’s similar to making gnocchi even if you haven’t done that. It’s more of an empirical fact, really. Anyway, the consistency you’re aiming for here is something close to clay (play-doh for grown-ups). It should still come together into a ball, but kinda rip, not stretch, if you pull it. Squash it, pull it and mash it for a minute, then set it aside to rest. Cut up the chicken breasts. I think chicken tacos work best when the chicken bits are super cute and tiny, so really go to town with that knife, like you’re some kind of demented plastic surgeon. I feel like I crossed a line there. Too far? Heat up a little oil in a pan and dump in your chicken pieces to start cooking. While it’s frying, finely chop your garlic clove and throw together your seasoning mix. 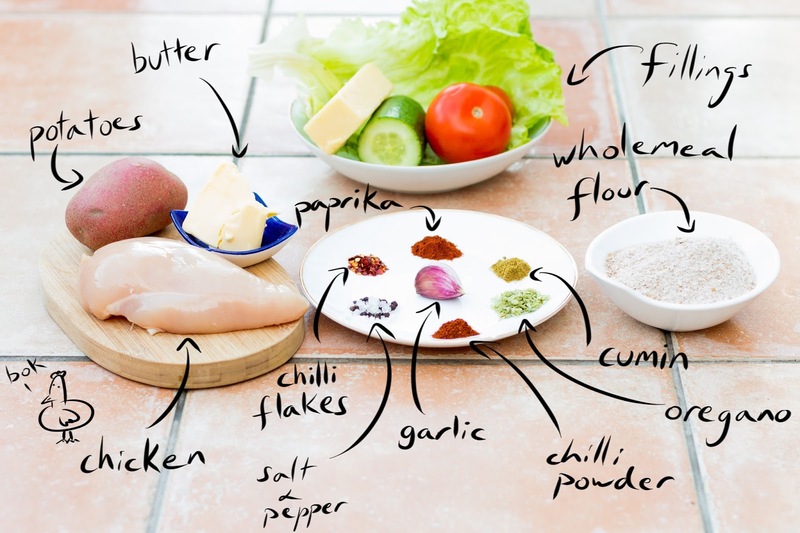 See all those other ingredients listed under Spicy Chicken? The cumin, chilli powder, oregano, paprika, chilli flakes, salt and pepper? All those seasonings? Yeah, mix ‘em together. There’s your seasoning mix. Go figure. Once the chicken is cooked through and just starting to brown, toss in the garlic and the mix, then turn the heat down. Stir it every now and then, and add a little water if it gets too dry, but otherwise it’s done. Now, it’s taco time. First up, start heating a flat bottomed pan. Okay. So you know how the dough isn’t stretchy like normal dough? That means if you tried to roll it out like normal dough, it would tear and fall apart like all your childhood dreams. So we’ll do exactly what you need to do for traditional, authentic tacos. Wrap it in industrially manufactured plastic! Seriously, it’s perfect for this. Lay out a single sheet on your counter, then place a lump of the dough (about the size of a golf ball) in the middle, and lay another sheet of plastic wrap on top. Press down with your palm to get it started, then roll it out into a really thin disk with a rolling pin. No extra flour, no flipping, no mess. To make sure it rolls out round, move the rolling pin like it’s on an 8-way directional pad. If you just go up-down and left-right, it’ll turn out… interestingly shaped. All you gotta do now is peel off the top layer of plastic, put your hand against the dough, turn it over, and peel off the bottom layer so you’re left with the dough disk resting on your palm. 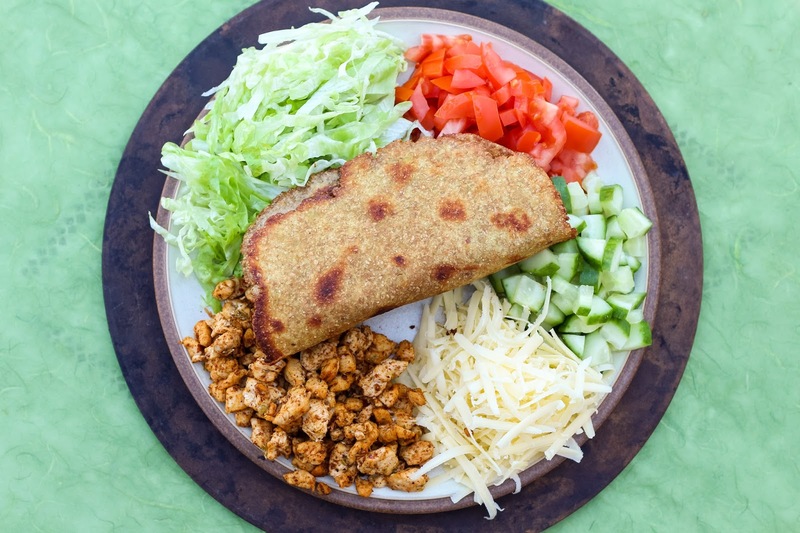 You’ll feel like some kind of taco wizard, because it works so perfectly it must be magic. Last thing you gotta do is drop about a tablespoon of butter into that hot pan, let it melt and bubble, then slip the disk off your hand and onto the pan to fry. Move it around and flip it over every minute or so. Once it’s brown and crispy, it’s done! To get that taco shell shape, drape it over a pot handle or something. As it cools, it’ll harden and go kinda crunchy, and alakazam! you’ll have your taco shell. Keep making the tacos until you have enough (if there even is such a thing), then fill them up with the chicken and all your other fillings. Or do what I do, and eat them as you’re making them! It’s like having a wondrous assembly line that ends in your mouth. Which is pretty much the dream, right? I adore your little chicken drawing (I totally made like a bokbok bawk-sound in my head). And your gnocchi-tortillas look really interesting! I am honestly that nerd that PLANS the taco and buys Masa Harina on iHerb (but I personally prefer wheat to corn tortillas for some reason anyway, even after painstakingly making them myself). I've even made gnocchi once from potatoes, but have decided that choux gnocchi is where it's at (check out Joe Pastry's stuff if you aren't already reading it on the regular, the guy is so patient and sooo knowledgable. http://www.joepastry.com/2013/choux-gnocchi/). Potato tacos is incidentally one of my faaaavourite tacos, but when I've had it before the potato was the FILLING and not the duvet so to speak. Oh your blog is so wonderful and inspiring! Wooee! Any details on the flavour of your potatotillas? Would you say more like a fritter or like duchesse potatoes? Gnocchi? Any rubberyness to the texture at all? And HOW crispy are they on a scale of about 1 to 10 where 1 is basically milk and 10 is a cracker? Great question about the texture and flavour, which I ludicrously omitted from the main post! Flavour wise... I don't really know. It's a bit like a savoury pancake I guess (like a breton galette), seeing as it's fried in butter. There's a subtle rich, nutty flavour from the wholegrain wheat. But overall, the flavour is fairly mild. I would totally encourage experimenting with adding more to the dough, like crushed coriander seed, or finely grated parmesan, or even just some chilli powder. Go wild! As for texture, they're not rubbery at all, but there's definitely a slight chew. Again, this comes from the wholegrain wheat. The crispiness comes from how long they're cooked, the longer the crispier. So if you want them crazy crispy, keep the heat low enough so they don't outright burn in spots, use lots of butter, and cook em until they're golden brown. Then quickly shape them before they cool and crisp up. 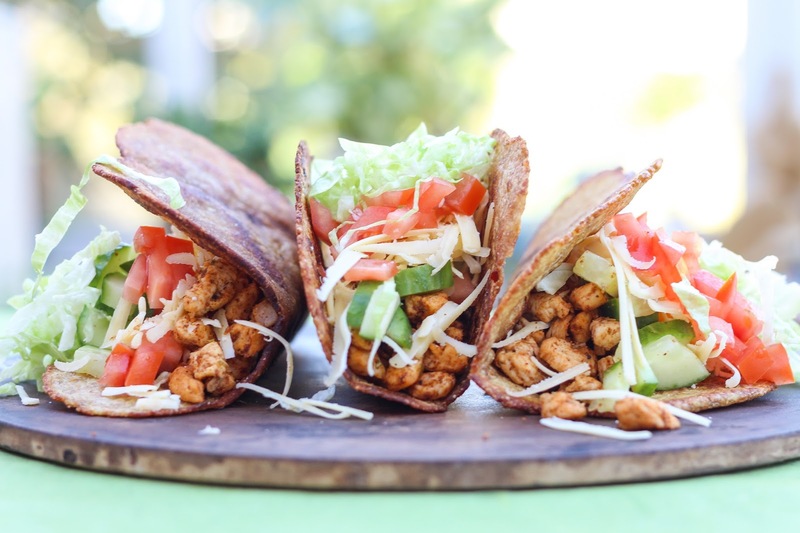 Faster cooking, with less butter, gives a more yielding, chewier taco. Like half way between a hard and soft shell. A semi-chub shell, if you will. BTW, I'm totally adding potatortillas to my vocabulary. Haha, I saw after a quick Google that both "potato tacos" and "Irish tacos" are already things, with the latter being filled with corned beef. Which... I don't... yeah, most Irish people my age have never even seen corned beef. But those Irish Americans can't seem to get enough of it! I'll definitely have to try some different potato fillings next time based on your recommendation. Do you go for creamy potato salad, or spicy Bombay potatoes? And I tried to sound all cool and stuff for the recipe, but I did actually go out and get masa harina from a specialty store... For science, of course. I had to compare them before I would be able to stand behind these. And though I do like that particular flavour that corn tortillas have... I think I'm with you on preferring wheat. But you can't make hard shell tacos from wheat tortillas. Having said that... making them from corn tortillas is a pain as well, because you need to pan cook them, then bake them (maybe you can bake from raw, but I don't know). So I really like these potato ones (potatacos) because they get crunchy just from the pan.